When you’re considering dating after divorce, there’s a good chance it’s not the best time yet. I know you want to be done with the pain of the past and move on. But going too fast will only cause more pain. It’s important to reflect on this possibility. 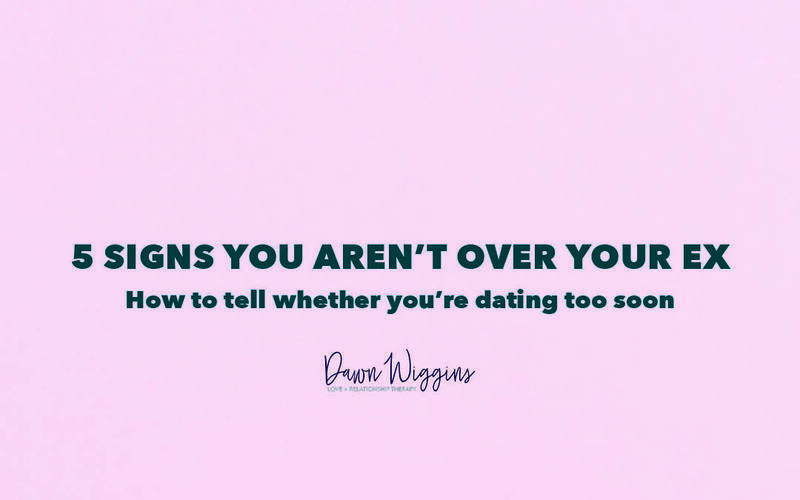 Check out the five signs you aren’t over your ex before you move on to dating or starting a relationship. What are the Signs You Aren’t Over Your Ex that Can Make Your Next Relationship Unsuccessful? Remember, there are no rules on dating after divorce. Some choose to jump right back in, while others prefer to wait. Dating may even no longer appeal to some divorcees, who opt out of it entirely. None of these decisions are wrong. Whatever your plans are for dating, it’s a very personal decision. But, it’s smart to explore certain factors before making your determination. Read below about the 5 signs you aren’t over your ex and you may need to slow it down. Maybe you’ve been frequently lied to, misled, or cheated on. Whatever the case, trust has been broken. A strong foundation of trust is one of the most critical aspects of a healthy relationship and is, alas, one of the things that can be most severely damaged during toxic relationships. Learning to trust again and overcoming feelings of hurt or betrayal are necessary things to work on before you step out on that first date; otherwise, you may find it challenging to embrace closeness with someone new. As I’ve mentioned before, if we are insecure, we are not likely to trust our own judgment or the actions of others. You’re coming from a Place of Loneliness. The reasons you want to date are vital to the success of a new relationship. What’s important here is the ability to make sensible decisions based on realistic wants and needs. Loneliness can be a common struggle after divorce and heading into dating while feeling isolated is unhealthy. The desire to be wanted again is natural and can be a forceful one following your split. However, if this feeling is the primary driver behind your yearning to date, it can skew your perspective and ability to reason. This leaves you more vulnerable and with a higher propensity to make lousy decisions. It’s so important to look at what motivates us! Download my dealing with loneliness meditation here. You still need time to grieve and rebuild. While certainly different than the grief of a loved one passing, divorce is a loss and comes with its own, and just as important, grieving process. Attempting to build a new relationship while still overcoming the ending of an old one is grounds for failure. Give yourself some time for the shock of “How did this happen to me?” to register and seek guidance from your therapist to work through it. This is not to say that you need to go through your period of grief alone. My Facebook Group: New Life After Divorce is an excellent place to begin the healing process and connect with those on similar journeys! Rebuilding your life and rediscovering who you are outside of your marriage is also essential. Everyone goes through these processes differently. Allowing yourself time to focus on these oh so important things will give you a confident leg up when you begin dating! You’re still focused on your marriage. Your marriage was and is a large part of who you are. It’s not something you’re expected to set aside, forget about, and never talk about again after your divorce. I mean, you invested a ton of time and energy in it, right? However, if you find yourself on a date rehashing what went wrong in your prior relationship or continuously speaking negatively about your ex, it’s time to step back. You’re not there yet. Going through a divorce is a lot to process, and you should feel free to take as much time as you need to work through your feelings. But dating is not the time or place for it. It’s not fair to the people you date and is not a healthy way to begin a new relationship. Not being focused on the failings of your previous marriage frees up more space to be present and mindful. Divorce rocks your world, and with it, you may find a certain amount of instability that you didn’t have (or didn’t notice) before. Things like your financial situation drastically changing or your children now sharing two separate homes, among other things, can leave you feeling drained and unsure. Adjusting to your “new normal” before tossing dating into the mix will make a world of difference in your confidence and stress levels. Happily, and successfully dating after divorce is possible! Take care of yourself first. Then go into your new dating life more poised and vibrant than you’ve ever been! You won’t regret it. If you can identify with the 5 signs you aren’t over your ex and want to learn even more about divorce recovery to rebuild your life; we should definitely connect! Sign up here to learn more about my Roadmap to Life After Divorce digital course. It’s a 12-week step by step program to help you shift from lost, stuck and alone to feeling hopeful, happy and worthy.